This is a copy of Kelvin Thomson's speech to the Annual General Meeting, Royal Park Protection Group Inc. Flemington Community Centre, 8 September 2012. Kelvin Thomson is a Federal Labor politician in the seat of Wills who stands out for his independent views on democracy and population in a government and opposition that seems depressingly unaware of the importance of these concepts and their effect on each other. There are many great things about Australia, but to my mind the greatest is the proximity we have to the natural world, to our physical surroundings. And for many people living in inner northern Melbourne, Royal Park remains a place where we still have that. It’s always held fond memories for me. I don’t have many fond memories of a fortnight spent in the Royal Childrens Hospital as a kid after I had my appendix removed, but the one consolation was looking down from my hospital window onto Royal Park and watching the bright orange Flame Robins which came in there in winter. Later on my brother and I learned a lot about native plants from the little native garden built around the Burke and Wills Memorial, and later again as a Melbourne University student I sometimes escaped to the native plant garden off Gatehouse Street. Royal Park has long been, and still is, a very special place. This afternoon I want to talk to you about Melbourne’s traffic mess – what causes it, and what the solutions are for it, and why the East-West Tunnel is not one of them. The key cause is population growth, which has exploded this century. 75,000 each year. This brings with it numerous unwelcome consequences – electricity, water and council rates rising much faster than the rate of inflation (and I’ve got copies of a speech explaining how this works down the back for people interested in this issue), the loss of a say in planning decisions for ordinary residents and communities, loss of housing affordability for young people in particular, and pressure on open space and native wildlife. But the consequence I want to zero in on this afternoon is traffic congestion. The 2001 Census recorded Melbourne at 3.3 million people. By the end of 2009 we got to 4 million; we are on our way to 7 million by 2050. This of course leads to more car ownership. 2.45 million. At the current rate of car possession per household, we will have an extra 1.1 million cars by 2036. Does anyone in this room seriously think moving in Melbourne is going to get anything but harder? 1 million extra cars! We get proposals for still more freeways to deal with all these cars but they don’t solve the problem; they just turn into toll roads that make motoring more expensive. Melbourne has one of the highest ratios of road space to population of any city, with Melbournians taking up more road space and generating more emissions per capita than Londoners. In 2007 there were an average 13.37 million trips a day in Melbourne, with 12 million of those taken by car. This increased car ownership and use in turn generates traffic congestion – Melbourne’s traffic mess. A major problem lurking for our economy is the burgeoning cost of traffic congestion in our major cities. Building new communities and new roads on the urban fringes of Melbourne will lead to more congestion, traffic which will ultimately hurt our economy. 1995. Congestion costs equated to $840 per capita. It is estimated this cost will rise to $8 billion by 2015, and equate to $2100 per capita. Road congestion costs in Melbourne will reach nearly $3 billion a year by 2020 under the present regime, a cost borne by every business and household. This morning I read the head of Infrastructure Australia saying that policymakers have to confront the challenges of traffic congestion. I agree with him that this is a major issue – I don’t think it gets anywhere near enough attention. The amount of time Melbourne drivers spend stuck in traffic, making our lives a misery and fuelling road rage, is a scandal. But where I part company with Infrastructure Australia is their proposed solutions – road tolls, a congestion tax on motorists who drive at peak times, allowing B triple trucks. These things won’t make life better for motorists, they will make things worse. But Infrastructure Australia’s candour about tolls means motorists can be very clear that if the East West Tunnel is built they’ll be paying tolls to drive on it – your weekly motoring bill will rise. I guess I will just have to add congestion taxes to the already long list of sacrifices that economists and business tycoons think we should make rather than rethink our addiction to population growth and GDP. They keep telling us that we are better off now than we were in the 1950s, 60s and 70s. Really? When we had free roads, free education, cheap petrol, water and electricity, and ice was delivered by a man with a van and a smile, not by a drug dealer. Tasman open door migration agreement with New Zealand, removing the baby bonus and increasing our foreign aid. This will reduce the pressures on our infrastructure and ease traffic congestion. Trying to build more infrastructure to keep up with population growth is a recipe for disaster – just like a dog chasing its tail, we will never be able to meet our infrastructure pressures until we stabilize our population levels. However until the happy day when Melbourne, Victoria and Australia embraces population reform, it is vital that we maintain the fight to protect our city’s liveability by protecting our city’s green wedges, open spaces, and preventing the constructing of more freeways, such as the East West Link Tunnel. Building more roads does not address congestion, it creates more congestion. In July this year I wrote to Prime Minister Julia Gillard, Minister for Infrastructure Anthony Albanese, Victorian Premier Ted Baillieu, and Opposition Leader Tony Abbott, following the announcement by Tony Abbott that a Liberal Government would contribute $1.5 billion towards an East-West Link Tunnel, and that Premier Ted Baillieu has now made it clear that the construction of an East-West Road Tunnel is his Government’s number one infrastructure priority, despite have no electoral mandate to do so. In my letter I explained that inner areas of Melbourne, including the suburbs of Coburg and Brunswick which I represent, are experiencing increasingly high levels of motor vehicle traffic, and becoming traffic sewers. Constructing a new road tunnel with entry and exit points accessing inner city areas will significantly exacerbate traffic issues. Research has been conducted which shows minimal numbers of motorists actually undertake the total east-west journey on a daily basis, rendering the entire proposal seriously flawed. In April 2007 I made my first submission to the East-West Link Needs Assessment Study being conducted by Sir Rod Eddington, under the direction of the then Victorian Labor Government. In my submission I outlined how the Victorian population was forecast to increase from the then 4.8 million people to over 6.2 million by 2031, and that it is essential our state has access to the most efficient and effective transport services. A plan for an additional road link between each and west Melbourne was first discussed by former Premier Jeff Kennett in the late 1990s, and ruled out in the Department of Infrastructure’s Northern Central Corridor Study in 2001. The central reason why the plan failed was because of its lack of utility, as the reality was the tunnel just wasn’t needed. The findings from the Department of Infrastructure’s original study also outlined that the proposal was rejected at that stage because it was identified that the arterial network could adequately provide for existing east west movements between the Eastern Freeway and Ballarat and Geelong Roads. The Department of Infrastructure also found the tunnel to be unnecessary because relatively little traffic actually crossed between the freeways. Congestion along the Eastern Freeway mostly came, according to their research, from peak hour commuters heading for inner Melbourne. A lot of these reasons why the East-West Link Tunnel was not needed in the late 1990s are the same reasons why we don’t need it now. At the time of making my first submission, in 2007, the tunnel was estimated by cost $10 billion. Yet recent reports suggest the tunnel will cost $5 billion, half the price despite being 5 years later. Think about it! Tackling congestion is not solved by building more roads. There is a variety of evidence which shows that increasing road capacity in congested road networks does not simply meet existing growth; it generates and induces more vehicle trips. As Kevin Costner said in “Field of Dreams”, “build it and they will come”. I outlined a number of evidence based studies in my 2007 submission, including findings from a leading international study that traffic grows when roads are uncongested, but growth rates decline as congestion develops. A local study conducted by the Department of Infrastructure in 1999 on the impact of traffic flows on the heavily congested Eastern Freeway since the construction of the Toll Free Western Link, found it “had no changes in the volumes on the Eastern Freeway”. Before its opening, CityLink was hailed as the solution to Melbourne’s cross-city traffic problems. Although while many expected the big increase in road space to result in free flowing traffic, the reality has been that daily congestion plagues CityLink, with large numbers of single vehicle occupants dominating. The findings of these leading international and local studies still ring true today – more roads result in more congestion. By simply increasing capacity and not trying to manage congestion we end up with more vehicle trips than would otherwise occur. The Eddington Report of 2008 made 20 recommendations. Some had many commendable features – such as plans for a rail tunnel from Footscray to Caulfield; a rail link from Werribee to Sunshine; and the proposal for electrification to Sunbury. But I did not support the proposal for a $10 billion east-west road tunnel. It is not just a question of the money, though we all know how these road projects have an uncanny knack of blowing out to double, or more, their pre-construction estimates. It is a question of how such a controversial megaproject will completely soak up the time and energy of the Minister for Infrastructure, Transport, Regional Development and Local Government, of department officers and of engineers so that other projects simply get postponed. The demand projections in the East West Needs Assessment are speculative. The traffic forecast for a new road tunnel assumes a low toll price and fails to factor in toll avoidance. This is odd given the experience of the Cross City and Lane Cove tunnels in NSW, both of which massively underestimated toll avoidance and hence over estimated traffic flows. “There is no substitute for careful cost-benefit analysis based on robust economic evidence and there are many examples around the world of projects founded on speculative demand forecasts, which did not deliver their purported economic benefits. Further research would be needed to understand the potential scale of these latent demands and the benefits may well be speculative. There is certainly enough for government to be getting on with in the meantime, to tackle the more certain looming challenges of congestion and overcrowding, where intervention offers far more certain economic benefits. Prioritization of transport spending must mean focusing on those schemes where the economic benefits are more certain’." If the tunnel goes ahead, it will be inevitably at the expense of public transport infrastructure in the eastern suburbs and other areas of Melbourne outer suburbs. It is those projects that we really need to meet Melbourne’s transport needs. This is not anti motorist, or anti truckie. Indeed, I believe many truckies and motorists who have no choice but to use the roads would welcome an invigorated public network which reduced road congestion and shortened their travel times. However despite the evidence that a road tunnel will worsen congestion, it appears Ted Baillieu has his heart set on getting the project underway. He announced in the Victorian Budget that the State Government would allocate $15 million towards an East-West Tunnel Study. This is a waste of money. It doesn’t bring the tunnel any closer. It’s a sham. There is simply no light at the end of the East-West Tunnel. Inner city residents have previously made it clear they do not want such a tunnel in their neighbourhood. In July it was reported that drilling in Royal Park is to proceed, with the State Government plotting 13 drill sites in and around the park to investigate a possible route for the East-West Road Tunnel. The cost of this project was said two years ago to be $10 billion. Now it is said to be $5 billion, with the Federal Opposition saying they’ll find $1.5 billion for it. What will happen is that motorists will have to pay tolls to use it. Whatever the amount of public money involved, I believe the East-West Tunnel is the wrong priority. It will not ease traffic congestion in Melbourne. 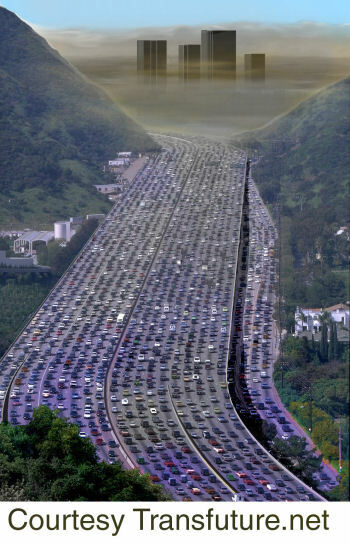 For years we have been told that one more freeway would solve Melbourne’s traffic congestion problems. I supported CityLink, I supported East Line, I supported the Metropolitan Ring Road, I supported the Craigieburn By-pass. But it never works. As many studies around the world have shown, freeways generate new traffic and new trips. It would be better to put public money into public transport. This will do more to help traffic congestion, more to contain carbon emissions, and more to help people who don’t drive cars, for example younger people, older people and people with disabilities. Public transport infrastructure is one of the great unmet needs of our time. Ever since the car took off in Australia, post-war public transport infrastructure has failed to keep pace with suburban growth. In Melbourne, there is a strong public transport infrastructure of train and tram lines out to Melbourne’s city limits circa 1950, but beyond that there is precious little. The million Melbournians who live beyond Melbourne’s 1950 city limits have to drive cars in order to leave their suburbs. Those who commute to the city or other parts of Melbourne to work face long, expensive and tiring trips to and from work every day. Taking their cars through the inner suburbs turns many inner areas into traffic sewers, doing nothing for the quality of life in inner Melbourne. Public transport currently plays a minor role in how this city gets around. Cars account for 91% of passenger kilometers, up from 89% in the mid 1970s, while public transport takes 9%, down from 16% in the mid 1970s. 50 kilometre railway connection from west of Werribee to Southern Cross Station which will link the Melbourne-Geelong railway from west of Werribee to Southern Cross Station via the Melbourne-Ballarat railway. It is public transport projects like these that should be the priority for connecting our already sprawling city, instead of more roads and freeways. Almost half of all new housing expected in Melbourne over the next decade will be built on the urban fringes where there is little access to public transport. A recent parliamentary report found that only in 100 residents in some of Melbourne’s outer suburbs used only public transport to get to work. 2000 and 2004. Suburban train services were extended from Broadmeadows to Craigieburn in 2007, resulting in a significant increase in train frequencies to Craigieburn station. Within the first 12 months of the new service, patronage through Craigieburn station grew threefold. The evidence clearly suggests that if we provide more options for people living on Melbourne’s urban fringe to travel, they will use them. We must do everything we can do to reduce car dependency and the solution lies in better public transport services. Then there is the question of carbon emissions. One of the greatest challenges facing the 21st century is the challenge of climate change. We cannot tackle climate change by building more roads. By all means let us build more transport infrastructure – let’s be a nation of builders – but let it be public transport infrastructure – trains, trams and buses. We cannot build out way out of congestion. We have been trying it for years and it does not work. Time and time again we have seen that increasing road capacity in congested road networks generates and induces more vehicle trips. US studies have shown that those US cities with a decent rail system have fewer congestion problems than cities which do not have a decent rail system. Professor Ross Garnaut’s paper on transport and urban planning included an issues paper which found that building new roads may make Australia’s greenhouse emissions from transport issues worsen. He noted that the provision of road infrastructure may induce growth in passenger car use by reducing the competitive advantage of public transport. There are plenty of worthy urban public infrastructure projects ready, willing and able to go. In Melbourne, the Eastern Transport Coalition incorporates the councils of Greater Dandenong, Knox, Manningham, Maroondah, Monash, Whitehorse, and Yarra Ranges. Its chair, Councillor Mick Van de Vreede, has said that, following the Eddington study, it is clear that we need a transport plan for the rest of Melbourne and, in particular, the eastern suburbs. He is right, and the sorts of projects that plan could end up giving effect to are a rail service along the Eastern Freeway corridor from Victoria Park to Doncaster; a heavy rail connection from Huntingdale station to Rowville, along the median of Wellington Road to Stud Park shopping centre; or duplication of the Belgrave and Lilydale lines beyond Ringwood station, with the addition of a third track in a number of locations along the Belgrave and Lilydale lines. There are also some good ideas for improving public transport access to Monash University. The evidence is clear. Our rapid population growth is putting unprecedented pressure on our public infrastructure, especially roads. And the evidence is also just as clear, building an East-West Tunnel will simply fuel congestion, at the expense of investing in genuine forms of sustainable transport including public transport and cycling. We have a responsibility to protect the livability and amenity of our beautiful city, so that future generations, our children and grand-children, are handed over a city in as beautiful condition as the one our parents and grandparents gave to us. Kelvin Thomson is one of a few politicians actually doing the job they are elected to do- to represent the interests of the people who vote for them. Why is this concept too hard to comprehend and administer? Now, it's appeasing cashed-up lobby groups and perpetuating the impossible myth of "economic growth" forever! Politicians like Kelvin seem to be heading for extinction, and are a dying breed. Thanks to Kelvin for actually speaking the truth, and revealing things as they are instead of all the shallow spin that usually comes out of their mouths.